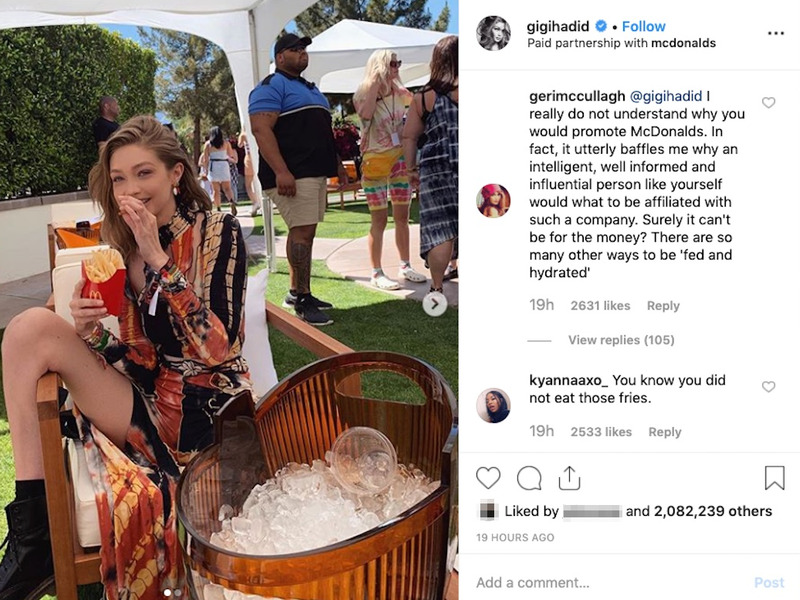 Fashion model Gigi Hadid is facing backlash for a recent Instagram post sponsored by McDonald's - and it reveals a challenge that the fast-food giant is still struggling to solve. While plenty of Hadid's fans loved the photo - which has been liked more than two million times as of Monday morning - others took issue with her partnering with the fast-food chain. Under the leadership of CEO Steve Easterbrook, McDonald's has been working to become - and be seen as - a "modern, progressive burger chain." In March, Politico reported that the company has stopped lobbying against minimum-wage hikes. The chain has also made changes such as switching to cage-free eggs, removing antibiotics from food, and using fresh beef in certain burgers.